Propolis (bee glue) has a long history of being used in traditional medicine and nowadays it is extensively used in food diet to improve health and prevent diseases such as inflammation, heart disease, diabetes, and even cancer. Because of its broad spectrum of biological activities there is an undying interest in the composition of propolis, which depends on the vegetation of the area from which propolis was collected. There are numerous reports in the literature on the isolation and structural elucidation of biologically active phytochemicals from propolis collected in Europe, South America, Asia and the Pacific region. However there is no data about chemical composition and biological activity of propolis from Pitcairn Islands1. The chemical profiles of Pitcairn propolis extracts were obtained by GC-MS analysis after silylation. The major constituents were terpenoids (mainly diterpenes and less triterpenes). Phenolic components (cardanols, alk(en)ylresorcinols and anacardic acids) are present in significantly lower amounts, as flavonoids and the usually present phenolic acids are completely absent. After detailed chemical investigation of propolis’ dichloromethane extract, four new cycloartane triterpenes with good antimicrobial activity, along with 18 known compounds, were isolated. The biological activity of this extract was also examined and the results showed that it inhibits human breast cancer MDA-MB-231 cells proliferation and induces changes of malignant cells’ morphology, which hint to apoptotic events. Apart from this the studied propolis extract possesses strong antimicrobial activity against some of the most common pathogens causing infections in humans: Staphylococcus aureus, Escherichia coli, and Candida albicans. Thus, the present research provides additional data for the tropical propolis constituents, revealing the distinct character of Pitcairn propolis. Furthermore, these findings once again certify the potential role of propolis as a natural chemopreventive agent and a valuable bioactive mixture for a combination therapy approach. Acknowledgements: The Pitcairn Island Producers’ Co-operative (PIPCO) for providing the sample. 1. Georgieva K, Trusheva B, Uzunova V, Stoyanova T, Valcheva V, Popova M, Tzoneva R, Bankova V (2018) New cycloartane triterpenes from bioactive extract of propolis from Pitcairn Island. Fitoterapia 128: 233–241. ISNAD TRUSHEVA, Boryana , GEORGIEVA, Kristina , POPOVA, Milena , UZUNOVA, Veselina , STOYANOVA, Tihomira , VALCHEVA, Violeta , TZONEVA, Rumiana , BANKOVA, Vassya . "New Insights into Tropical Propolis: Propolis from Pitcairn Island". 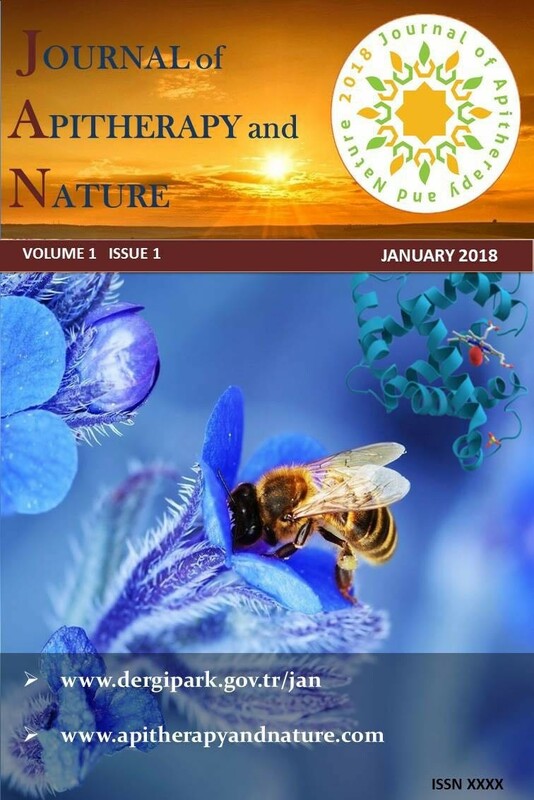 Journal of Apitherapy and Nature 1 / 3 (December 2018): 30-30.